Holly, Alexa, Lily, and Nick are Stargazers, which is the term for Starkeepers in training. 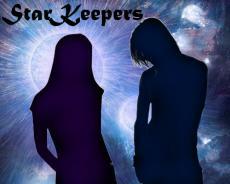 Starkeepers tend to the stars, making sure they have everything to keep burning bright in the sky. Full Starkeepers are given powers, such as the ability of flight, and many other useful things that help tend to the stars. The stars power their city, and provide the light for them. There's more to this story! Read the chapters as they come, and find out what happens next!